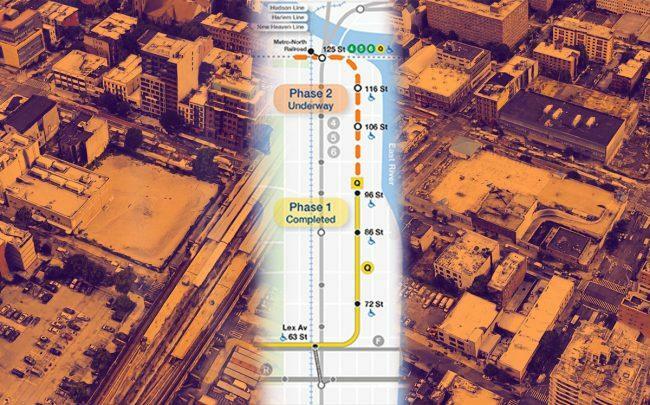 Phase II of the Metropolitan Transportation Authority’s Second Avenue Subway plan appears to have been taken off the back burner. How will that affect developers who have bought in the neighborhood recently? The Durst Organization and Extell Development have collectively spent hundreds of millions on large development sites near the proposed last stop of the extended Q line, and the MTA has been meeting with representatives of both firms to discuss “various scenarios” involving the properties, the New York Post reported. Durst bought two sites on the south side of 125th Street, on both sides of Park Avenue (and both sides of the elevated Metro-North railway station), for a total of $111 million in 2016 and 2017. One block east, Extell picked up the entire south side of 125th Street between Third and Lexington for $70 million in 2014. The MTA envisions a last stop on 125th Street between Lexington and Park, right in the middle of these properties. The station’s construction will be further complicated by the fact that the MTA plans to link it to the existing 125th Street station on the 4, 5 and 6 lines, on Lexington Avenue. In addition to transit easements, the MTA’s environmental statement from last July lists “potential property acquisitions” as part of the plan, some of which overlap with the Durst and Extell sites. Both developers told the Post that discussions with the MTA were “collegial and constructive.” The MTA declined to comment.